Make a rainbow to wear round your neck for St Patrick's Day, Spring, or any time you need something bright and pretty to cheer you up! 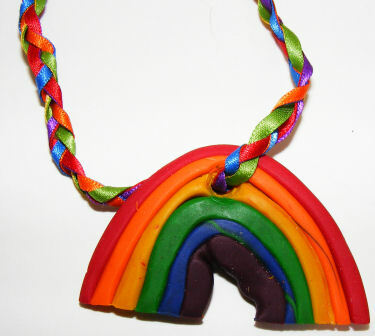 Polymer clay (you need the colours red, orange, yellow, green, blue and purple. However as long as you have red, yellow and blue you can mix the others). Thin lengths of ribbon in red, yellow, orange, green, blue and purple. Take a very small amount of each colour of clay. Roll into a sausage shape. Lay the lengths of clay next to one another so they are in the order of the rainbow. Press lightly together so they all stick. Shape your clay to form a semi circle, trimming any uneven edges with a knife (with adult supervision). Make a hole in the top centre of your rainbow. You can use a sharp pencil or a plastic drinking straw to make the hole. Ask an adult to bake according to the manufacturers' instructions. Leave to cool. Lie your ribbons together so that they meet at the top and tie together. Separate into 3 groups of two strands, and plait. Thread the ribbons through the hole in the rainbow. Knot the two ends of the lengths of ribbon together and wear with pride. You could also make a matching rainbow brooch! This fingerprint rainbow is a fun activity for little ones - perfect for St Patrick's Day, a Noah's Ark or general rainbow theme. This handprint rainbow makes a fantastic classroom or large group project and looks dazzling on the wall! Perfect for St Patrick's Day, Noah's Ark, or any rainbow theme - as well as for Rainbows' Promise and Pot of Gold Ceremonies. The children will enjoy making these rainbow castanets for St Patrick's Day - remember there's a pot of gold at the end of every rainbow!